All nine miners trapped underground in a Pennsylvania coal mine for three days have been brought safely to the surface by rescue workers. The men were lifted out of the mine to scenes of jubilation from rescuers and crowds gathered at the scene, about 55 miles (90 kilometres) south-east of Pittsburgh. All the men were taken to local hospitals, where they were to remain for 24 hours and be reunited with their families. Rescue workers, who had drilled for three days to get to the men, finally penetrated the chamber where the miners had been trapped in an air pocket at 2220 EDT on Saturday (0220 GMT Sunday). A telephone wire was dropped through a small air pipe to listen for sounds, then a rescue worker heard the voices of the men who told him all nine were safe and well. "What took you guys so long?" one miner asked. 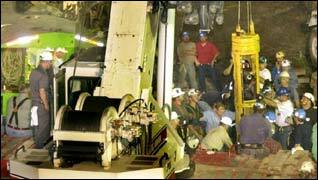 Randy Fogel, the first miner to be winched from the shaft, emerged to a round of applause and cheering from rescuers. The men were then brought up every 15 minutes; the fourth man managed a weary smile as he was helped out of the shaft while the last man to leave the mine gave the gathered crowd a thumbs up. The families of the men, who had gathered in a nearby Red Cross Shelter, wept with relief at the news. Rescue workers were ecstatic after days of desperation. "It's just unbelievable," mine rescue worker Lou Lepley said. "I have no words to describe it." John Weir, president of the mining company where the men were employed, praised the miners for their bravery. "They're the toughest people who walk the earth," he told French news agency AFP. The state Governor, Mark Schweiker, had earlier made the announcement that the men were alive at a press conference to cheers from the attending crowd. The dramatic news came after three tortuous days in which rescue workers battled to drill more than 235 feet (70 metres) below ground to reach the men, who were trapped in a water-logged chamber in freezing temperatures. The men became trapped on Wednesday after accidentally drilling through the wall of a nearby disused mine which collapsed, sending 50 million gallons (189 million litres) of water into the shaft in which the men were digging for coal. Emergency teams dug two escape shafts down towards where the men were trapped. They began digging a back-up shaft after a huge drill bit jammed in the first shaft, but work on the second shaft was also beset by mechanical problems. The drill bit was eventually dislodged, but it delayed the rescue operation by several crucial hours. Emergency workers had also pumped compressed air into the chamber in the hope of enabling any survivors to breathe. No communication of any kind had been received from the men since Thursday, and many had begun to fear the worst.